Run an automatic seizure detection in adults. It takes at the most 5min for a 24h EEG. Seizure review to facilitate decisions on the ictal findings. EEG review for efficient reporting e.g. on routine EEG. EEG report and seizure report are created automatically during the review. Add events and images by 1-click to the report. Flexible licensing model to fit your requirements best in neurological praxis, hospitals or epilepsy centres. Combine this product with more BESA products according our new reliable pipeline to analyze interictal spikes and seizure onset in EEG. 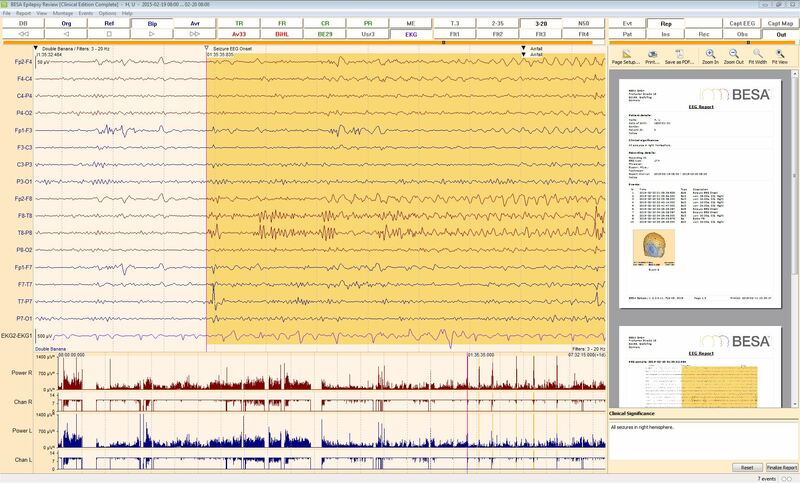 Manage the data of 14 different EEG data formats in one patient database. Easy to install and quick integration into your system. Run an automatic spike detection with 91% sensitivity in adults and children. Spike detection takes at the most 3h on a 24h EEG. Spike review to evaluate the detected events based on hyperclusters and the related clusters. Add images and comments by 1-click to the spike report. Select a patient and the EEG review epoch instead of files. You want to save time on long-term EEG evaluation? BESA Epilepsy 2.0 provides automatic spike detection with 91% sensitivity in adults and children. The automatic clustering and hyperclustering of the detected interictal activity is an efficient feature for the EEG evaluation. Spend 5 minutes a day to evaluate a 24h EEG. Print your final report or store it a PDF. BESA Epilepsy 2.0 provides automatic seizure detection in adults. The algorithm has been developed at the Epilepsy Center, Department of Neurology, Universitätsklinikum Erlangen. Spend again 5 minutes a day to evaluate the ictal activity in the 24h EEG. The seizure review provides quick navigation from seizure to seizure and efficient report generation. Start the spike detection directly after your recording starts and you can evaluate the EEG nearly online. For offline analysis the spike detection requires approximately 3h to analyze a 24h EEG and the seizure detection requires at the most 5min on a 24h EEG. You want to evaluate EEGs recorded by different systems in one application? BESA Epilepsy 2.0 is able to read 14 different EEG data formats. Manage your data in one common database. Select the patient and choose a review interval to start the EEG evaluation. Don’t think in files any longer. * The EEG data format requires installation of the corresponding EEG system software.